In this project we'll use C# to find out which comm port is assigned to the FTDI UMFT234XF USB to UART module. The example code can be used with most FTDI devices and shows how to use the FTDI DLL to make the appropriate calls for information and control. 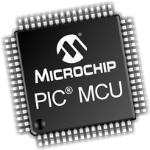 The end result is a very low cost and high speed serial port that we can build upon for a variety of MicroChip PIC projects. 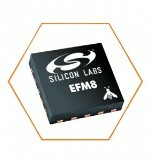 FTDI Driver: Be sure to install the driver for the FTDI module at http://www.ftdichip.com/Drivers/VCP.htm. The current version that I'm using as of 11/11/2016 is http://www.ftdichip.com/Drivers/CDM/CDM21224_Setup.zip. FDTI DLL: Go to the FTDI C# examples page at http://www.ftdichip.com/Support/SoftwareExamples/CodeExamples/CSharp.htm and download the FTD2XX_NET.DLL zipped folder. 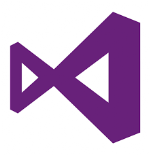 C#: Download and install the free Microsoft Visual Studio 2015. 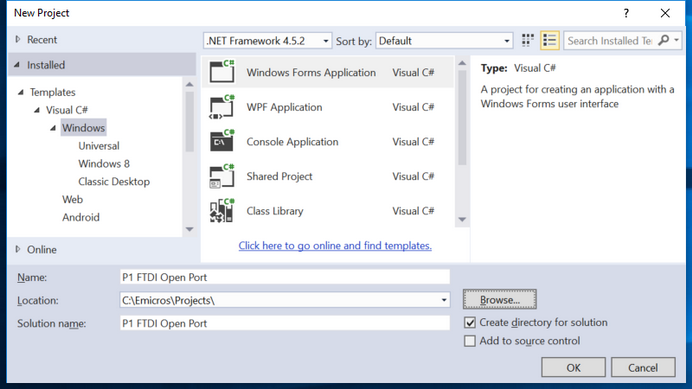 Launch Visual Studio and create a new Windows Forms Application. I named it "P1 FTDI Open Port" and placed it on the C drive at C:\Emicros\Projects\. Unzip the FTD2XX_NET folder. The current version that I'm using is FTD2XX_NET_v1.0.14 but versions after that should be ok. Copy the 3 files to the new C# project you created. Under the Project tab click on Add Reference and then browse to your project folder and Add FTD2X_NET.dll. Click OK after adding it. On Form1 add a listbox control and name it listBox3 and also add a button and name it alt_open_btn. Add the following code shown in green. The last statement to add is the GetVirtuCommPort(); to Form1_Load() as shown below. Now when you execute the program with an FTDI device connected you should see something similar to the following. In this case I had a BARECAN connected and it was found on Comm Port #4.